Last year we noticed Moroccan prints were trending. This year we've noticed something even better is trending: Moroccan-inspired lights. It's hard to go wrong when decorating in Moroccan style. The colorful, fun nature eases the pressure to be perfect and lends itself to more personalized decorating styles. There are no rules, only fun. If you're a QVC shopper, you'll be happy to know the online QVC store has a Moroccan Candle Impressions® Flameless Candle. 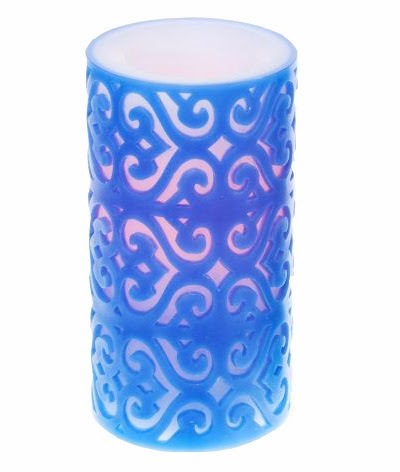 This 6" Wax Flameless Candle comes with a Programmable Timer and has a battery-run time of 1,000 hours on a single set. The color is so vibrant, it's a great way to incorporate a little Moroccan into your house. Looking for a challenge? There are plenty of DIY Moroccan lantern tutorials we love. The timer and remote control option on Candle Impressions® flameless candles makes them a great light source for lanterns, plus you don't need to worry about heat emitting any toxic fumes from the paints used on the lanterns. We love this Moroccan Lantern Chandelier Indie Fashion and Beauty created. It would be so beautiful in a front hall with high ceilings, over a dinner table, or outside under an overhang. To make this DIY a lot easier, you can use Candle Impressions® Flameless Pillars with a Remote Control. With battery-run times of 1,000 hours on a single set of batteries, opting for the 3 Pack Remote Control Set is much easier than wiring it into your electrical system. Let us know if you've found any Moroccan DIY crafts worth doing. Candle Impressions invented the first flameless candle over a decade ago and we have since expanded our collection to be the comprehensive assortment in the industry. Brilliant and beautiful, we provide safe and authentic candlelight. Visit us at www.candleimpressions.com to learn more.